Looked up overhead at the railroad wires while at the Whistle Stop Tour on 1/17/2009. Security was everywhere including the airways. I heard a chopper up in the air and was scanning the skies and saw this image. I had a thought that we were in The Matrix (you'll have to watch the movie to understand if you're not a fan). 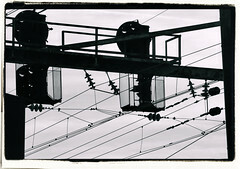 The wires all overhead... and the two railroad lights you see could be the Sentry's guarding it. Be sure to click on this image to see it in LARGER sizes and on a black background.